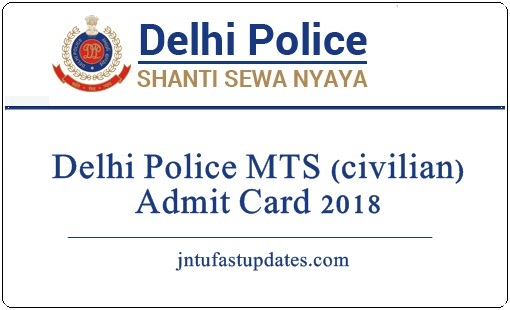 Delhi Police MTS Admit Card 2018-2019: Delhi Police Department is going to organize the Multitasking Staff (MTS) written test shortly. Candidates applied for Delhi Police MTS posts must get ready to attend the examination as per the scheduled dates. Candidates have to download Delhi Police MTS admit card to attend the examination. The hall ticket will be accessible to download before 10 days of the examination (approximately). Aspirants can download Delhi Police MTS Hall ticket from the official website, delhipolice.nic.in. The hall ticket/call letter is the most important document to attend the examination. The examination officers will allow the aspirants only after verifying their admit cards. Hence the hopefuls competing for the test are instructed to download and preserve the hall tickets safe to attend the examination. More information about Delhi Police MTS hall ticket is given in this article. Delhi Police Department yearly issues various job notifications to hire the suitable candidates into various posts. This year the department announced 707 vacancies for various posts. The Delhi Police MTS jobs include MTS Civilian (Cook, Water carrier, Safai Karamchari, Mochi (Cobbler), Dhobi (Washerman), Tailor, Daftri, Mali (Gardener), Barber, and Carpenter. Many of the aspirants having the suitable eligibility standards have applied for Delhi Police MTS posts. The organization received thousands of applications this year. Selection of suitable candidates will be done through the written test and interview rounds. Candidates have to qualify the selection rounds to get the job in Delhi Police Department. Applicants can check the details clearly once after downloading the hall ticket. Checking all the details clearly, take a printout of the admit card to carry it to the examination. Candidates can contact the Delhi Police Department authorities for any of the necessary corrections in any of the columns on the admit card. Do not forget to carry the hall ticket and also any of the valid identity proof copy while going to the examination. The Identity copy Xerox document of Aadhar card, PAN Card, Passport, Voter ID or any other can be carried. The admit card gets downloaded on the screen. Go through it clearly to check all the details once. Keep it in a safe place to carry it to the examination.